If you were a child of the 60’s, 70’s or even early 80’s, you might just remember a few of the great classic Christmas decorations listed below! Mary and I have a tradition of decorating for Christmas the day after Thanksgiving. 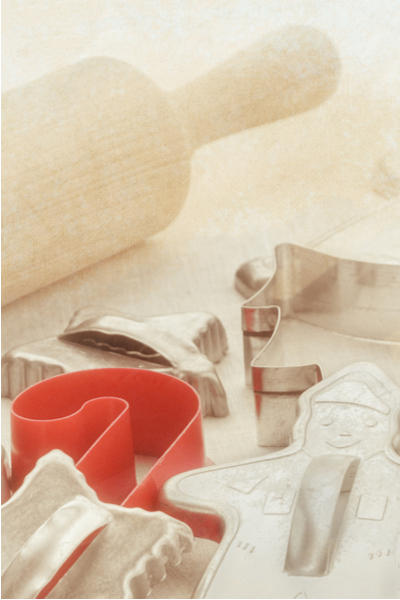 Although not a “decoration” – I still remember my mom’s classic set of metal cut-out cookie cutters she brought out every year to make her Christmas cookies. This year, during our annual decorating, we somehow found ourselves deep in conversation about childhood Christmas memories. It brought back a flood of memories for us both. Especially when it came to remembering all of those cool, and maybe not-so-cool Christmas decorations from our early years. So we thought today we would list a few of our favorites, and ask readers to share any they can remember as well in the comments section at the end of the article. Here is to hoping a few of our memories of classic Christmas decorations ring true to your childhood as well! Who doesn’t remember the oh-so-incredible bubble light strands that used to light up Christmas trees? Both of us can recall having these fascinating strands on our childhood trees. 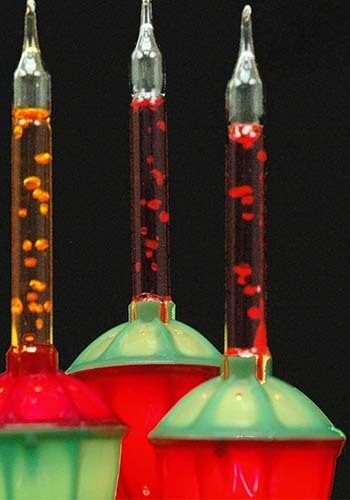 I still remember the magic of watching the liquid inside begin to bubble up as the lights warmed. I also remember half of them not working, but hey, let’s keep this a happy! These perhaps were my mom’s least favorite of all decorations. Especially when it came to decorating the tree! 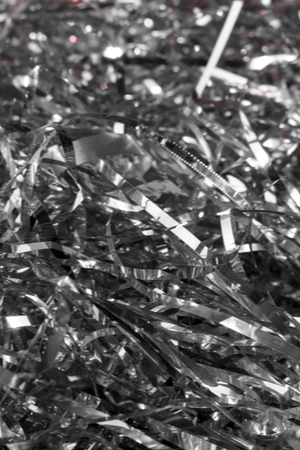 Remember the individual tinsel? It would take forever to put on – and forever to take off! They came in big packs of long strands, and were used to make “icicles” on the tree. The idea was to put them a few at a time on the tree to let it shimmer. I, however, remember my brother and I getting bored with the decorating chore and simply throwing huge chunks on the tree. And of course, getting the familiar “that is not how they are supposed to go on” reprimand from our mom. The other thing about icicles, I remember finding them everywhere for months on end well after Christmas. Of course, lighted garland strands have now taken the place of the chore of icicle decorating. Yes, LED lights are incredibly safe, energy efficient and bright. 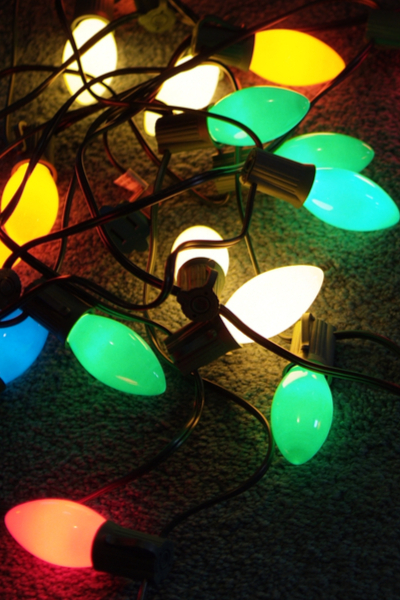 But call us old-fashioned, we still remember fondly the over-sized Christmas bulb strands from yesteryear. There was something so big and colorful about them, and I loved the big individual screw in sockets that made them feel like regular light bulbs. And yes, the best part was that if one light went out, they really all did go out! We both still remember getting the job of screwing in bulb after bulb trying to find the one that was out! Although no-one really knows for sure how it started, this classic holiday tradition still exists today in many households. Who wants to put a tree skirt or blanket at the bottom of the tree when you can have a train circling below! 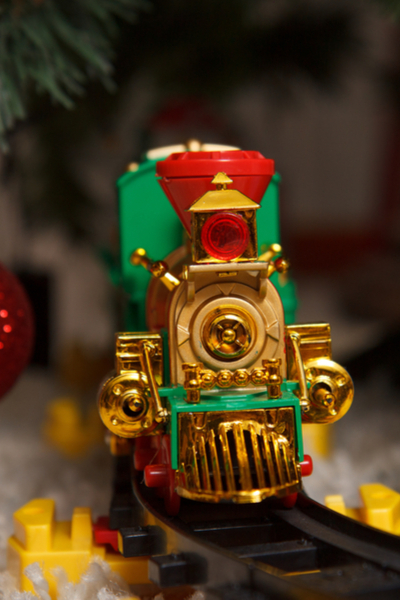 The old train around the tree is still a classic Christmas decoration. Toy trains became popular in the early 1900’s. And it right around that time that folks began putting them around their trees. We always had a train that we got out at Christmas every year, but we never put our train around the tree. Thinking back, it was probably because our parents didn’t want us playing around the tree and toppling it over. Probably a wise idea! 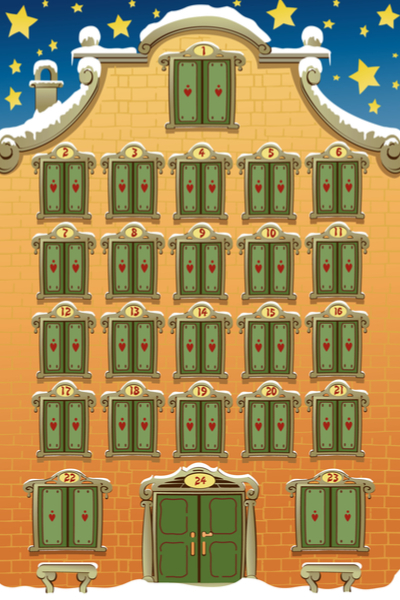 It didn’t take us long during our trip down memory lane to remember the Christmas calendars. The old countdown calendars where you open up a little cardboard door every day to reveal a photo. Or if you were really lucky, maybe your’s had some type of treat behind each door! 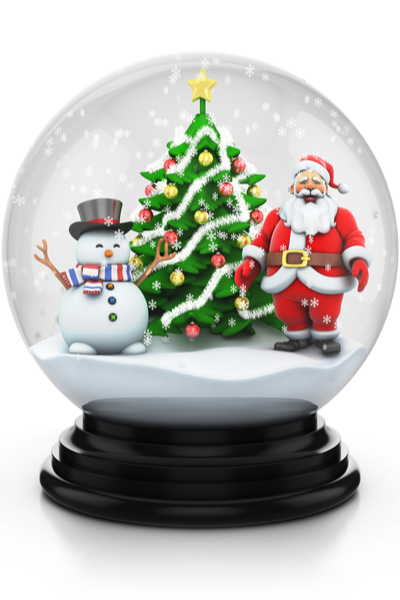 Who didn’t have the Christmas snow globe that when shaken, erupted in a big snowstorm falling over some Christmas scene inside of the glass. Although the globes still exist today, I can’t ever quite find the “real” heavy glass one that I remember was placed on top of our stereo entertainment center each and every Christmas. Yep, the kind of stereos that were a piece of furniture – and had a record player and an 8-track player. Wow! And on top of the other side of the stereo there was always a classic ceramic Christmas tree. I remember it well! 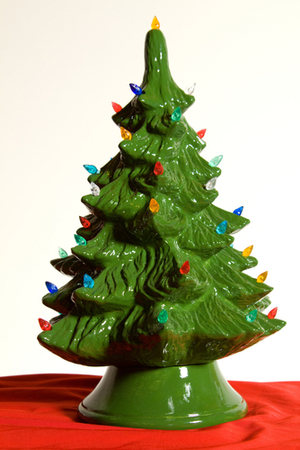 Every single year, one of my “decorating” duties as a child was to pull out the green ceramic Christmas tree, and set about installing what seemed to be an endless amount of colored plastic bulbs. Maybe the most well-known of the classic Christmas decorations – the ceramic Christmas tree! The funny thing is – at 93 – my mom still puts that out every year on that same incredible old stereo. 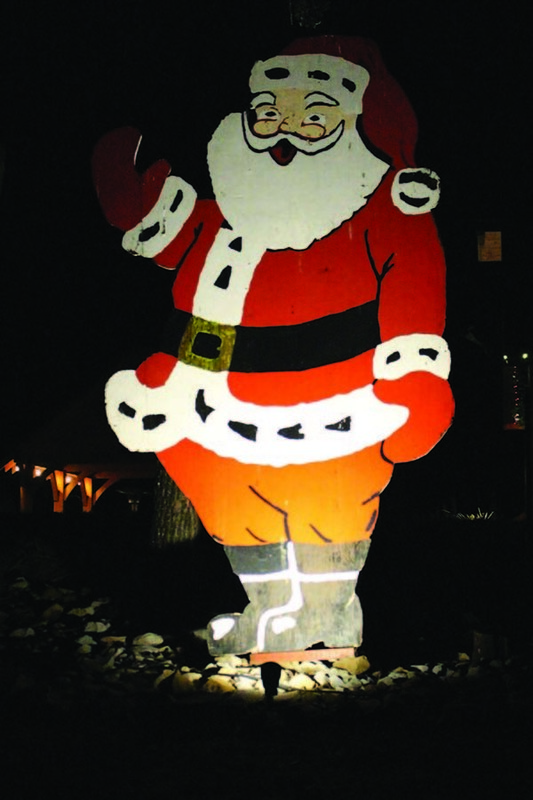 For me, the best memory is of our big wooden Santa that went up every year. It was made and given to my parents as a housewarming gift in the early 70’s. Year after year, my dad would put it up between two big pine trees in front of the barn. And after he passed, my brother and I, and then other family members would put it up as well. Santa in front of our house – still going strong! Here is to hoping for a wonderful Holiday season for all – Jim and Mary. Please feel free to share with all your own memories below in the comments! We had all of these, but I had forgotten. Thank you for this memory jog. WAY before the ‘elf on the shelf’, we had an elf that was part of our holiday decorations, that creeped out me and my brother, and my own kids as well, LOL! He was dressed in a shiny gold outfit, had a plastic face, and eyes that seemed to follow you…He was unfortunately lost, in a series of moves, which is sad, because I would love to have been able to share him with the grands, and prove that the ‘elf on the shelf’ is a lot older than many think! I also have bubble lights on my tree each year and use many of the ornaments my parents purchased in 1946 as newlyweds. I remember so many of these things, but I remember when the tinsel was so heavy that it would pull the branch down. They contained lead back in those days until it was identified that lead would make people sick. That is when it was changed to what tinsel is today. I would say that was beck in the 60’s when I was still a teen. You couldn’t thorw it in handfuls back them or it could weight the tree branches sadly… LOL!!! Thanks for the memories. I still have two strings of bubble lights, bought way back in the 70’s that go on the tree every year, and most of them still work. I also still use the big old lights, I just keep replacing the burned out ones with extras I have. As well I have a ceramic tree, that not only lights up, but plays a song. My loving God-mother gave it to me one year when I had surgery just before Christmas. Some things are just too good to get rid of. Thank you for sharing these beautiful memories. We are having a gentle snow fall as I write this. I have continued to decorate using most of these traditions and greatly enjoy knowing that they are as meaningful to others as they are to me! Hopefully they will bring happy memories to my children too. What a great post! I still hang the silver icicles on my tree, and yes they take a long time to put on and off. My favourite ornament is a little red house my Mom and Dad bought for their first Christmas in 1947. That house has always been on our family tree, and will be passed on to grandkids, and great-grandkids as time goes on. It is the ornament everyone looks for when they see the tree.